I recently opened my emailed copy of the Burpee newsletter to discover their big sale on kale. A well-timed message, but there was one problem. The newsletter had pictures of collard greens, not kale! This got me to thinking. Apparently, a lot of people don't know what kale looks like. There has been some confusion, too, between kale and Swiss chard. I've caught people labeling their Swiss chard plant pictures as kale. Whoops! Just to set the record straight: kale, like most garden produce, comes in many varieties. However, despite the variance in its appearance from one cultivar to the next... kale should not be mistaken for Swiss chard or collard greens. These plants do not resemble each other, other than the fact that they all have big, green leaves. Additionally: I routinely cook all three of these vegetables for my family in various recipes. The difference is obvious in that Swiss chard takes the least amount of time until tenderness. 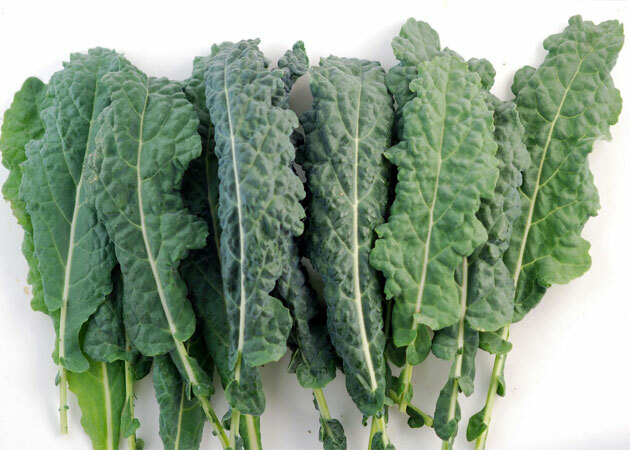 Kale comes in at a close second - those thickly-ribbed veins sometimes need a few minutes longer to become soft. And collards take quite even longer than the other two before they become palatable. I would even recommend blanching them for about 20 minutes prior to sauteeing in garlic or onions (for an additional 10 minutes or so), as collards tend to be tough and bitter. I thought it would be easy enough to find, and post, some pictures of kale, as well as the aforementioned, mistakenly identified veggies. I even double checked Wikipedia for their entry on collard greens. Nowhere in this lengthy desciption do they mention ever calling it "flat leaf kale!" So, for your information, below find some pictures to help you differentiate between these three delicious, hearty and healthy fall and winter veggie favorites: kale, collards, and Swiss chard! "Dinosaur Kale," Sweet Potato Chronicles. Notice the leaves are somewhere between flat and curly, with scalloped edges. A bit different and more fancy than common curly kale, pictured just beneath this photo. Curly Leaf Kale (my garden). Deep, blue-green, curly leaves. Tough, ribbed stems that should be snapped off before cooking. Hearty and mild tasting, great in soups! Grows happily beneath the snow which makes it even sweeter. Swiss Chard, my garden. Notice the shiny, bright green leaves, and thick, celery-like stalks. Chard comes in a rainbow of stalk colors - red, yellow, orange. It doesn't care for the cold, and won't last past the first frost! Collard Greens, my garden. These impart an almost cabbage-like flavor, but more bitter. They're tough, and take longer to cook than the other greens. The heartiest of the three types of green leafed veggies. Got some great pics of your own showing some neat varieties of kale, collards and/or Swiss chard? Feel free to share on our Facebook page! I buy my kale, collard and broccoli starter plants from Ceirech's Nursery in Pohatcong, NJ! Since they don't seem to carry Swiss chard plants, I typically start those from Burpee seeds. GardenBedsNJ.com is owned by Mike Hyde and 4 Seasons Lawn Care. We build, deliver and install raised garden beds to Hunterdon and Warren Counties in NJ and Northampton County, PA. Contact us for more information: 908 783 5733 or email mikehyde@4seasonslawns.com today!